Mahindra has just launched the first anniversary edition of the KUV100 at Rs 6.37 lakh (ex-Delhi), Rs 13,000 more than the regular version. The KUV100 was launched in January 2016 and has sold over 42,000 units since launch. The anniversary edition will be available in the top-spec K8 variant and feature cosmetic changes only. The changes include a new dual-tone paint scheme and larger 15-inch alloy wheels. There are two new colour options - flamboyant red and dazzling silver - with the roof painted in contrasting metallic black. The interior too is covered in a sporty black theme instead of the grey colour scheme that's present in the usual KUVs. 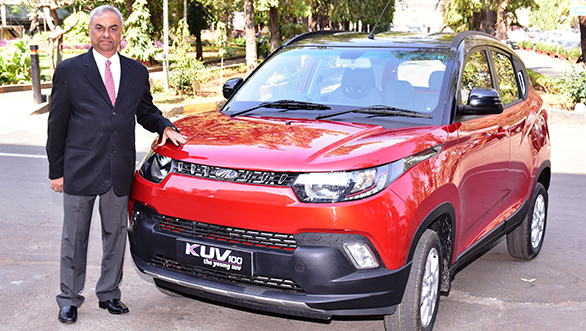 Speaking at the launch, Pravin Shah, president and chief executive, M&M Ltd, said that the anniversary edition KUV100 will further build the style quotient of the KUV, thereby increasing its appeal among the youth. Customers can also opt to personalise their KUV100 by choosing from the four available accessory kits - sporty interior and exterior kits, or the premium exterior and interior kits. In addition to the anniversary edition KUV, Mahindra has introduced new 14-inch spider alloy wheels in the K6/K6+ variant of the KUV100. The Mahindra KUV100 goes up against the recently launched Maruti Suzuki Ignis and the soon to be launched Grand i10. Like the KUV, the Ignis too is targeted at the youth, and you can read our first drive review of the vehicle here.